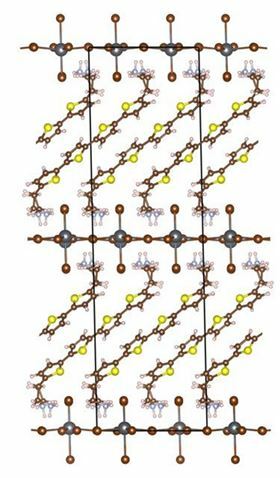 This shows the molecular structure of the layered hybrid perovskite investigated in this study. Image: Volker Blum, Duke University. Materials scientists at Duke University have computationally predicted the electrical and optical properties of semiconductors made from extended organic molecules sandwiched between inorganic structures. These so-called layered ‘hybrid organic-inorganic perovskites’(HOIPs) are popular targets for light-based devices such as solar cells and light-emitting diodes (LEDs). The ability to build accurate models of these materials atom-by-atom will allow researchers to explore new material designs for next-generation devices. The materials scientists report their results in a paper in Physical Review Letters. "Ideally we would like to be able to manipulate the organic and inorganic components of these types of materials independently and create semiconductors with new, predictable properties," said David Mitzi, professor of mechanical engineering and materials science at Duke. "This study shows that we are able to match and explain the experimental properties of these materials through complex supercomputer simulations, which is quite exciting." HOIPs are a promising class of materials because of the combined strengths of their organic and inorganic components. Organic materials have more desirable optical properties and may be bendable, but can be ineffective at transporting electrical charge. Inorganic structures, on the other hand, are typically good at conducting electricity and offer more robust mechanical strength. Combining organic and inorganic components can affect their individual properties while creating hybrid materials with the best of both worlds. Understanding the electronic and atomic-scale consequences of the interaction between the components, however, is challenging at best, since the resulting crystals or films can be structurally complex. But because these particular HOIPs have their organic and inorganic components in well-ordered layers, their structures are somewhat easier to model, and researchers are now beginning to have success at computationally predicting their behaviors at an atomic level. "The computational approach we used has rarely been applied to structures of this size," said Volker Blum, associate professor of mechanical engineering and materials science and of chemistry at Duke. "We couldn't have done it even just 10 years ago. Even today, this work would not have been possible without access to one of the fastest supercomputers in the world." That supercomputer – dubbed Theta – is currently the 21st fastest in the world and resides at Argonne National Laboratory. The group was able to gain time on the behemoth through Blum securing one of only a dozen Theta Early Science Projects, aimed at paving the way for other applications to run on the system first launched in late 2017. Blum and his group are now co-investigators on one of the US Department of Energy's prestigious Innovative and Novel Computational Impact on Theory and Experiment (INCITE) awards, allowing them to continue their work. In the new study, Chi Liu, a graduate student in Blum's laboratory, Yosuke Kanai, a fellow theorist at the University of North Carolina at Chapel Hill, and Alvaro Vazquez-Mayagoitia, a scientist at Argonne National Laboratory, used Theta's computational power to model the electronic states within a layered HOIP. This HOIP was first synthesized by Mitzi more than a decade ago. While the electrical and optical properties of the material are well-known, the physics behind how these properties emerge have been much debated. The team has now settled that debate. In a series of computational models, the team calculated the electronic states and localized the valence band and conduction band of the HOIP's two components: the organic bis(aminoethyl)-quaterthiophene (AE4T) and the inorganic lead bromide (PbBr4). These properties dictate how electrons travel through and between the two materials, which determines the wavelengths and energies of light the HOIP absorbs and emits, among other important properties such as electrical conduction. Liu then went further by tweaking the materials – varying the length of the organic molecular chain and substituting chlorine or iodine for the bromine in the inorganic structure – and running additional computations. On the experimental side, Mitzi and collaborator Wei You, professor of chemistry and applied physical sciences at the University of North Carolina at Chapel Hill, are working on the difficult task of synthesizing these variations to further verify their colleagues' theoretical models. The work is part of a larger initiative called the HybriD3 project aimed at discovering and fine-tuning new functional semiconductor materials. The collaborative effort features a total of six teams of researchers. Joining the researchers located at Duke University and the University of North Carolina at Chapel Hill, Kenan Gundogdu and Franky So at North Carolina State University are working to further characterize the materials made in the project, as well as exploring prototype light-emitting devices. "By using the same type of computation, we can now try to predict the properties of similar materials that do not yet exist," said Mitzi. "We can fill in the components and, assuming that the structure doesn't change radically, provide promising targets for materials scientists to pursue." This ability will assist in the search for better materials for a wide range of applications. For this particular class of materials, that includes lighting and water purification. Inorganic light sources are typically surrounded by diffusers to scatter and soften their intense, concentrated light, which leads to inefficiencies. This class of layered HOIPs could make films that achieve this more naturally, while wasting less of the light. For water purification, the material could be tailored for efficient high-energy emissions in the ultraviolet range, which can be used to kill bacteria. "The broader aim of the project is to figure out the material space in this class of materials in general, well beyond the organic thiophene seen in this study," said Blum. "The key point is that we've demonstrated we can do these calculations through this proof of concept. Now we have to work on expanding it."